Three Dogs, a boy and Peter Morrissey. What do three mismatched mutts, a 12 year old boy and Peter Morrissey have in common? 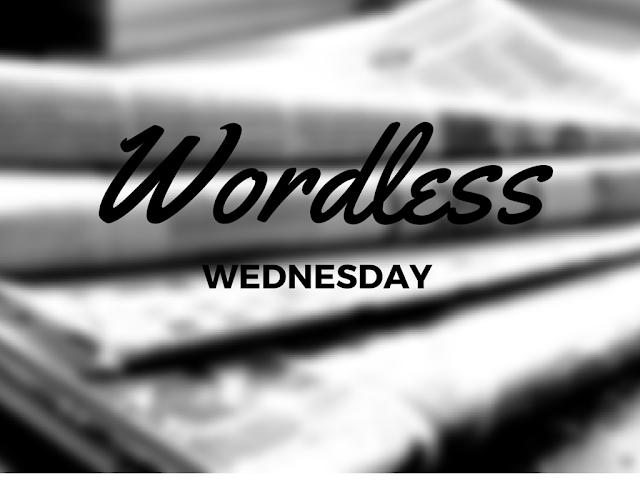 They all feature on today's Wordless Wednesday post. Well, it's not actually Peter ... it's his instagram ... but ... you'll see. First things first, let me present to you, my boy. We are currently dog sitting for my step-daughter which is one of the greatest things to happen for this lad. Since our beloved Max died three years ago he's been yearning for another canine to cuddle. Well, now he has three. Can't you feel the love? Meet my boy - with Alfred Winston, Esmeralda May and Rupert. Now for Peter Morrissey. I was leisurely scanning my Instagram love on Monday when I noticed Peter Morrissey's name pop up. Was he commenting on one of my photos? This is me posing and trying to be all fashion bloggy in Sydney a few weeks ago. I'm wearing my Peter Morrissey wrap front blouse with Esprit Jeans, old heels and Sash & Belle clutch. Here I am sitting in among the cute babies and inspirational quotes on Peter's Insta wall. Feeling the love from an Aussie designer is definitely a highlight of my week. 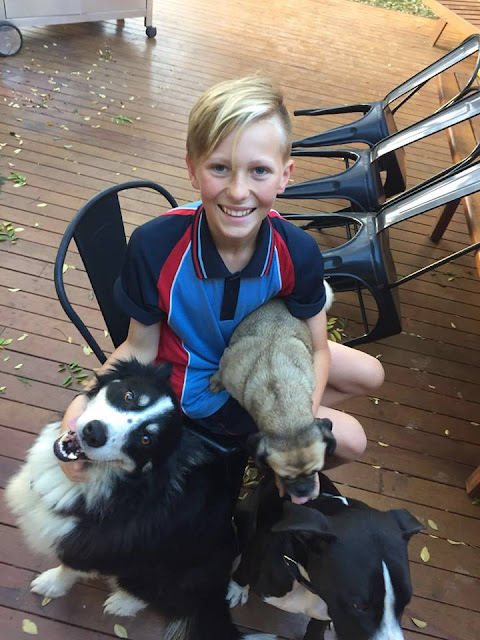 Feeling the love of three dogs is the highlight for my boy. Sharing the love via photos on this (almost) Wordless Wednesday is ... well ... priceless! Aww! that photo is cute heheh! Haha. Will do Steve! You too. Happy Wednesday in Sydney, thank you Leanne, for popping by Oh My Heartsie Girl's Wonderful Wednesday to join in the party, so nice to make your acquaintance. Love all that you are!!!! Hope you have a aussie day! Hi Karren. Great to meet you too. The boy must be in heaven. Wow...Peter Morrisey. That is so awesome and what a lovely post this was, Leanne. What a great post! Thanks so much for linking up at NanaHood.com or I would have missed it! Great to meet you Teresa. Today's photos made me smile! Never thought my jeans and Big W blouse would make it in the fashionista stakes, but there you go! Your boy looks so excited with the dogs! Sounds like you've had a great week! Dogs, dogs, dogs ... everywhere I look there's dogs. Awww being liked and reposted by your fave is just the most amazing thing! Congrats! Hope you can join my linky too! What's your linky Pixiedusk? Feel free to share. Go you... looking all super stylish. What will you be getting up to next?! I get so excited when a brand regrams or even likes my photo on Insta. Such a thrill! How exciting Leanne. You do style well. I love your boy's shine. Dogs truly light our world. Thanks for linking up (last week) I'm catching up due to a busy week.